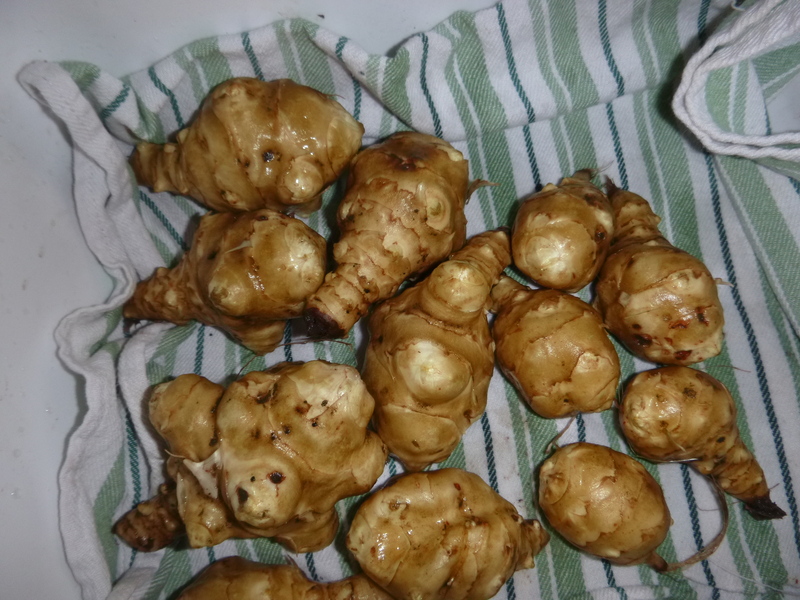 Yesterday in the bitter cold, we dug up a few plants worth of Sunchokes. 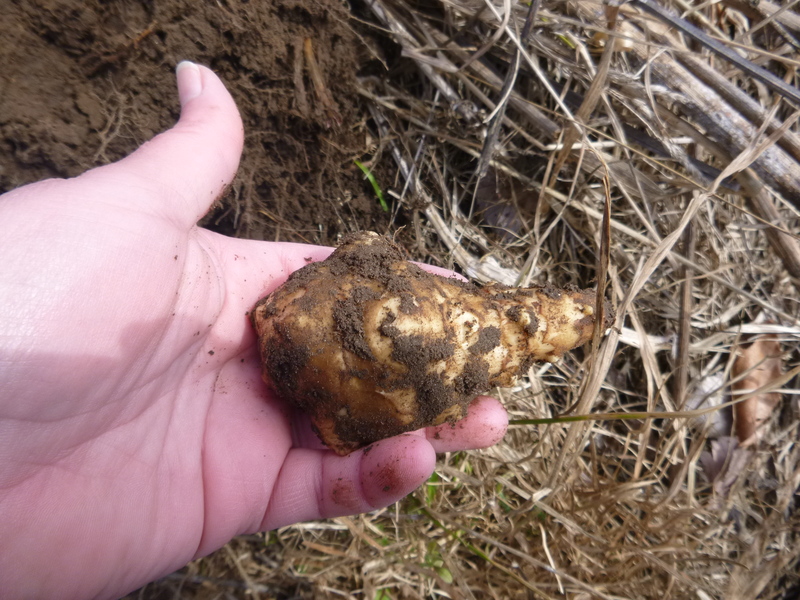 Sunchokes, the vegetable formerly known as “Jerusalem artichokes,” are the tuberous roots of a native North American plant in the sunflower family — neither from Jerusalem nor related to artichokes — originally cultivated by Native Americans. The Oxford Companion to Food says that the plant was noted in writing as early as 1603, when Samuel de Champlain (the same guy Lake Champlain is named after) described the root as tasting “like an artichoke,” ostensibly starting the naming confusion that has plagued the vegetable since its European debut. • Sunchokes enjoyed much popularity in Europe after their introduction, until they started developing a reputation for causing excessive amounts of flatulence. • This actually has some basis in reality, as sunchokes contain a great deal of inulin, which does cause gas and bloating when eaten in excess. • Sunchokes are adapted to colder climates, and taste better when harvested after the first frost. • The bulk of sunchokes grown in Germany go toward the production of a liqueur called Topinambur, made from sunchokes and a mix of herbs. • Sunchoke plants are considered weeds in some part of the country and can be quite invasive if left unchecked. The tiny ones went to the pig bucket, the bigger but still small went as rabbit fodder and the rest came in the house, some to be used like a fresh crisp fleshed raddish but with a light celery taste to me.. The bigger ones are going to make soup and some where fried up this morning to become egg and chip..
As many folks have noted, when starting these, eat them in very tiny amounts and then wait, try them cooked first before you try then raw. They are not a eat sudden large amounts, one of the biggest mistakes I hear is that folks say they are like potato’s..
No, they are not! other then being a tuber.. they are nothing like a spud.. 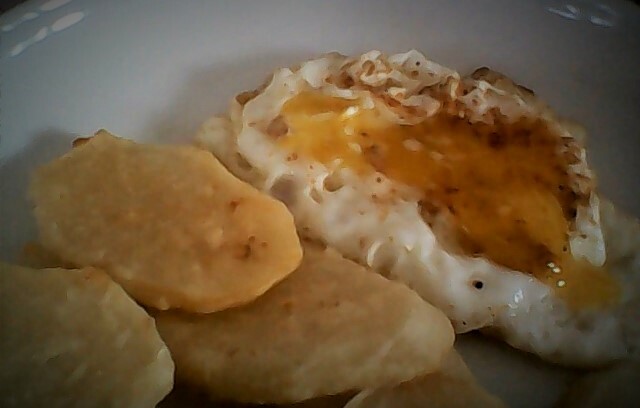 I fall down in the middle, a thinner sliced that is fried, is crispy on the outside and melt in your mouth creamy and rich tasting on the inside.. love and dipped into a egg yolk. O my what a delight..
Undercook them even just a little and they are NOT creamy.. its a fine balance but done correctly, I stand firmly in the creamy area but again.. not mashed creamy like spuds, cooked well and blended.. o my yes..
We currently have four different strains of the sunchokes on the farm at the moment and I am running tests on them, I would very much like to breed more that have nice big ones like this one below.. if they fill my hand, I am very well pleased.. I find the amount produced per plant can be quite different as can the size, shape and color.. The greens can be used as fodder as well, you want to cut them at full growth just before they start to flower if using them as a green fodder for the best quality.. 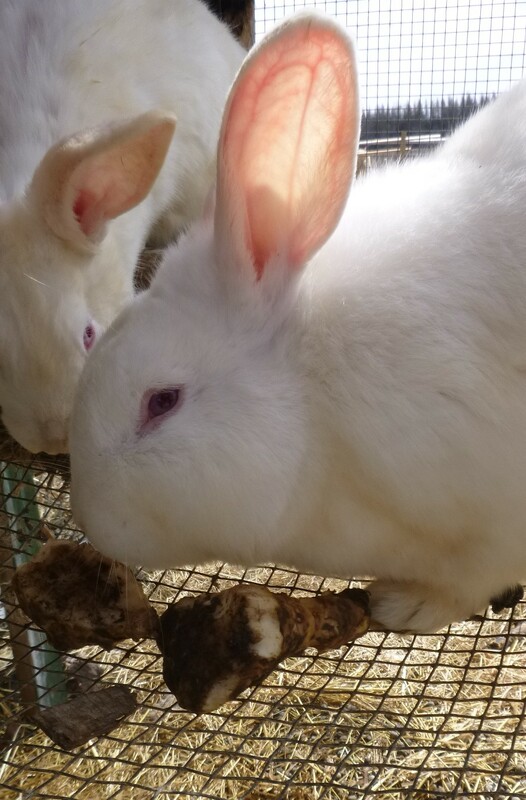 They are rabbit approved here on the farm.. while they can go in with dirt on, they equally like them cleaned up.. harvest as needed as they do not have good keeping power, and they are so easy to keep in the ground, why would you not? As anyone will tell you that has grown these, do not, please do not put them in your regular garden area that you want to do rotation in.. they never truly leave area once they are set up in it well, it takes years to clear a space.. and even then.. more will come.. 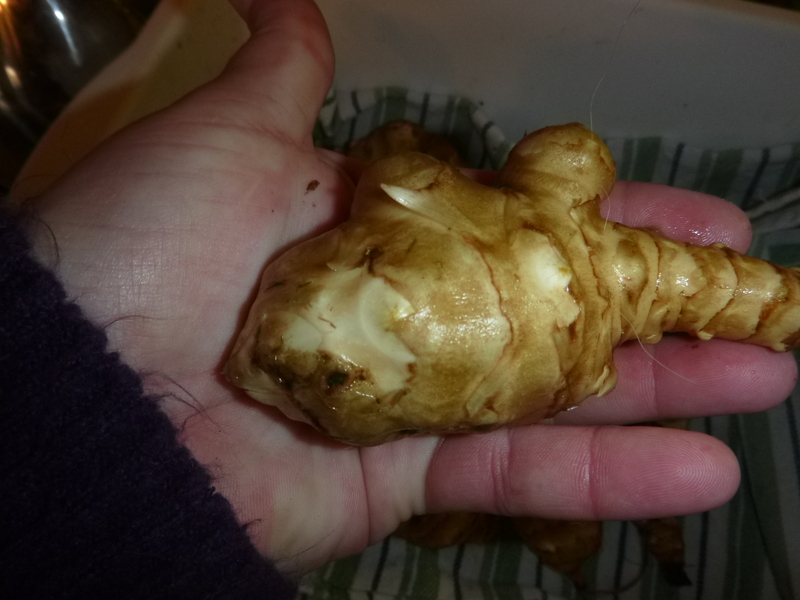 This entry was posted in Life moves on daily and tagged Feeding Rabbits Sunchoke greens, Feeding Rabbits Sunchokes roots, Feeding Sunchoke plants as green fodder, Fried Sunchokes, sunchokes. Bookmark the permalink.